Low back pain is one of the most common problems people have. About 60 – 80% of the adult U.S. population has low back pain, and it is the second most common reason people go to the doctor. Low back problems affect the spine’s flexibility, stability, and strength, which can cause pain, discomfort, and stiffness. Most back pain can be prevented by keeping your back muscles strong and making sure you practice good mechanics (like lifting heavy objects in a way that won’t strain your back). 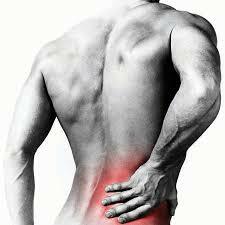 Low back pain is usually caused by and injury — strain from lifting, twisting, or bending. However, in rare cases low back pain can be a sign of a more serious condition, such as an infection, a rheumatic or arthritic condition, or a tumor. A ruptured or bulging disk — the strong, spongy, gel-filled cushions that lie between each vertebra — and compression fractures of the vertebra, caused by osteoporosis, can also cause low back pain. Arthritis can cause the space around the spinal cord to narrows (called spinal stenosis), leading to pain. Risk factors for back pain include age, smoking, being overweight, being female, being anxious or depressed, and either doing physical work or sedentary work. In many cases back pain will get better with self-care. You should see your doctor if you pain doesn’t get better within 72 hours. You can lower your risk of back problems by exercising, maintaining a healthy weight, and practicing good posture. Learning to bend and lift properly, sleeping on a firm mattress, sitting in supportive chairs, and wearing low-heeled shoes are other important factors. Although you may need to rest your back for a little while, staying in bed for several days tends to make back pain worse. Medications used to treat low back pain include nonsteroidal anti-inflammatory drugs (NSAIDs) such as ibuprofen (Motrin, Advil) and naproxen (Aleve), muscle relaxants such as carisoprodol (Soma), and steroids such as prednisone. Your doctor may prescribe opiates such as hydrocodone (Lortab, Vicodin) for short-term use. An injection of a corticosteroid (cortisone shot) may also help decrease inflammation. Exercise moderately at least 30 minutes daily, 5 days a week. Get your health care provider to okay you for exercise before starting a regimen. Omega-3 fatty acids, such as flaxseed and fish oils, 1 – 2 capsules or 1 tablespoonful oil daily, to help decrease inflammation. Omega-3 fatty acids can increase the risk of bleeding and potentially interfere with blood-thinning medications such as warfarin (Coumadin) and aspirin. Glucosamine/chondroitin, 500 – 1,500 mg daily. In some studies, glucosamine and chondroitin have helped relieve arthritis pain. It has not been studied specifically for low back pain. People with allergies to shellfish should not use glucosamine. There are some concerns that chondroitin may worsen asthma symptoms. Glucosamine and chondroitin may interact with blood-thinning medications such as warfarin (Coumadin) and aspirin. Methylsulfonylmethane (MSM), 3,000 mg twice a day, to help prevent joint and connective tissue breakdown. In some studies, MSM has been shown to help relieve arthritis pain. Bromelain, 250 mg twice a day. This enzyme that comes from pineapples reduces inflammation. Bromelain may increase the risk of bleeding, so people who take anticoagulants (blood thinners) should not take bromelain without first talking to their health care provider. People with peptic ulcers should avoid bromelain. Turmeric is sometimes combined with bromelain, because it makes the effects of bromelain stronger. Bromelain may interact with some antibiotic medications. Herbs are generally available as standardized, dried extracts (pills, capsules, or tablets), teas, or tinctures/liquid extracts (alcohol extraction, unless otherwise noted). Mix liquid extracts with favorite beverage. Dose for teas is 1 – 2 heaping teaspoonfuls/cup water steeped for 10 – 15 minutes (roots need longer). Turmeric (Curcuma longa) standardized extract, 300 mg three times a day, for pain and inflammation. Turmeric is sometimes combined with bromelain because it makes the effects of bromelain stronger. Turmeric can increase the risk of bleeding, especially for people who take blood-thinning medication. Ask your doctor before taking turmeric. Devil’s claw (Harpagophytum procumbens) standardized extract, 100 – 200 mg one to two times daily. Devil’s claw has been used traditionally to relieve pain. One study found that more than 50% of people with osteoarthritis of the knee or hip or low back pain who took devil’s claw reported less pain and better mobility after 8 weeks. Devil’s claw may increase the risk of bleeding and interact with diabetes medications, so tell your health care provider before taking it if you also take blood-thinning medication or if you have diabetes. Devil’s claw can affect the heart and may not be right for people with certain heart problems. It can also potentially be problematic for people with gallstones. Willow bark (Salix alba) standardized extract, 500 mg up to three times daily, to relieve pain. Willow acts similar to aspirin. Do not take white willow if you are also taking aspirin or blood-thinning medications. Check with your health care provider if you are allergic to aspirin or salicylates before taking white willow. Do not give Willow should to children under the age of 18. Capsaicin (Capsicum frutescens) cream, applied to the skin (topically). Capsaicin is the main component in hot chili peppers (also known as cayenne). Applied to the skin, it is believed to temporarily reduce amounts of “substance P,” a chemical that contributes to inflammation and pain. One found a topical capsaicin cream relieved pain better than placebo in 320 people with low back pain. Pain reduction generally starts 3 – 7 days after applying the capsaicin cream to the skin. Although very few studies have examined the effectiveness of specific homeopathic therapies, professional homeopaths may consider the following treatments to relieve low back pain based on their knowledge and experience. Before prescribing a remedy, homeopaths take into account a person’s constitutional type — your physical, emotional, and psychological makeup. An experienced homeopath assesses all of these factors when determining the most appropriate treatment for each individual. Contrast hydrotherapy — alternating hot and cold — may help. Alternate 3 minutes hot with 1 minute cold. Repeat three times to complete one set. Do two to three sets per day. Apply oil directly to skin, cover with a clean soft cloth and plastic wrap. Place a heat source over the pack and let sit for 30 – 60 minutes. Repeat this procedure for 3 consecutive days. Reviews of clinical studies have found that acupuncture may be effective for low back pain. In addition, acupuncturists frequently report success in treating low back pain, and the National Institutes of Health recommend acupuncture as a reasonable treatment option. An acupuncturist may use a comprehensive approach including specialized massage, warming herbal oils, and patient education. A study using acupuncture to treat 1,162 patients with a history of chronic low back pain found that at 6 months, low back pain was better after acupuncture treatment — almost twice as better than from conventional therapy. Patients had ten 30-minute acupuncture sessions, generally two sessions per week. According to a comprehensive review conducted by the Agency for Healthcare Research and Quality, spinal manipulation and NSAIDs are the two most effective treatments for acute low back pain. Of these, only spinal manipulation was judged to both relieve pain and restore function. Spinal manipulation also appears to be effective for chronic low back pain, but the evidence is less conclusive. There is evidence that suggests that the mind-body practices of yoga and tai chi offer significant relief of the symptoms of low back pain.